Andrew Bostom and Robert Spencer have both recently written pieces critical of the idea that Islamic Anti-Semitism was a product of Nazi propaganda. As any honest reader of the Koran already knows, Islamic Anti-Semitism, and general intolerance for non-Muslims originated with Mohammed himself. While Mohammed had set out to replace the region's existing religions, including Judaism and Christianity-- he only succeeded in eradicating and replacing the majority of the local polytheistic religions. While sizable numbers of Jews and Christians were forcibly converted to Islam, during the more than millennium of occupation of the Middle East-- the religions themselves survived. This was something of a theological problem for Islam, which had shamelessly looted both Judaism and Christianity's holy books for material, and claimed Mohammed as the successor to both religions. But in reality, Islam only succeeded in replacing the polytheistic religions that were its true core. So that while on the surface, Jews and Christians were supposed to hold a higher status than pagans, Muslim resentment toward them ran far deeper than toward religions that Islam did not consider to be part of its chain of succession. Muslim daily prayers to this day reference Jews and Christians. "Guide us to the Straight Way. The Way of those on whom You have bestowed Your Grace, not (the way) of those who earned Your Anger (such as the Jews), nor of those who went astray (such as the Christians)"
This prayer is also the opening of the Koran. And it demonstrates markedly more hostility toward the Jews, than toward the Christians. As does the Koran itself, which dated to a time when Muslims were at war with the Jews, but were not yet significantly at war with the Christians. The above translation incidentally comes from the Hilali-Khan translation of the Koran, the most popular Sunni translation of the Koran. Muslims however avoid using this translation for non-Muslims, as one Muslim site explains; "I strongly recommend that you use an alternate translation of the meaning; the Hilali & Khan work is the least appropriate for dawah work; it comes across to non-Muslims as extremely bigoted... Scroll down to 1:7 and imagine you are trying to use that translation to bring Islam to a Christian or Jew.". The 1:7 being referred to here is the above quoted text. Dawah is Islamic missionary work. Of course it comes across to non-Muslims as bigoted... because it is. 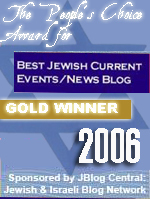 Now it's possible to go into exhaustive detail on the subject of Islamic anti-semitism. Plenty of such work has been done. Entire books have been written on the subject, among them by Andrew Bostom. But it's sufficient here to simply point out that every time a Muslim opens the Koran and every day that he prays, he is reminded that Allah hates Jews and has very little use for Christians. It would be very hard to imagine such religious indoctrination not resulting in bigotry. 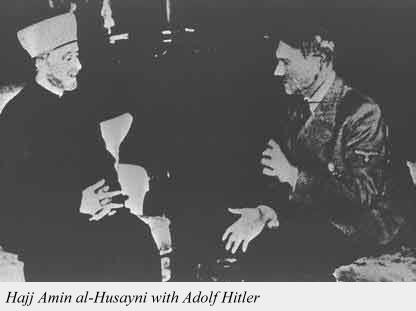 However Nazism had a profound impact on modern Islamic anti-semitism as well. While in some Asian countries such as Japan, their attempt to export Anti-Semitism was baffling and confusing to the locals-- Anti-Semitism was not a brand new product in the Middle East. But the Nazis had successfully used Anti-Semitism as one of their tools of political organization at home, and to form cross-cultural connections by finding common ground in other parts of the world. The Jews gave the Nazis and the Islamists something in common. Not the only thing of course. Some of the Nazi elite were looking around for a replacement for Christianity, because of its Jewish associations and what they felt was its excessive humanism. Meanwhile the Islamists wanted to understand how to Islamize their countries in the wake of the fall of the Ottoman Empire, while challenging modernism. For the Nazi elite, Islam was fascinating because it emphasized obedience to authority and fused power and religion in a way that was appealing to them. For the Islamists, Nazism demonstrated how a reactionary ideology could use political organization to take over a country and move it back spiritually to the dark ages, while still being able to compete on the global stage. And so the Cult of Hitler would owe something to the Koran, just as the Muslim Brotherhood would owe something to Mein Kampf-- which today remains one of the most popular books in the Muslim world. For Muslim rulers, Western dictators always had a special appeal because they maintained power without giving in to liberalization. But for the Muslim world, Nazism was more than just a dictatorship, it showed how political organization could be transformed into political power. 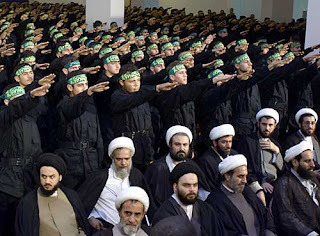 And even after Hitler's defeat, numerous coups in the Muslim world would be derived from Nazism-- from secular Arab Socialist ones like Nasser's in Egypt to radical Islamist ones like the Ayatollah Khomeni's in Iran. Both men had been strongly influenced by Nazi propaganda. But that propaganda did not teach them to hate Jews. Muslims did not need a lesson from the Third Reich on hating Jews. It was there every time they opened the Koran. What the Third Reich did teach them however, was that Anti-Semitism could be a powerful tool of political organization. This was not an entirely new idea in the Muslim world either. After all Mohammed's campaign against the Jews had as much to do with gaining followers with the promise of loot, as it did with religion. Much as Hitler's own had as much to do with finding ways to pay for his attempt to combine capitalism and socialism, without annoying either the owners or the workers-- as it did with Nazi ideology. And throughout the centuries, plenty of Muslim mobs had been led by men who understood that Ibtach al Yahood (Kill the Jews) was a safer cry than Down with the Caliph, but that once the mob had assembled and was looting the Jewish quarter, they might be feeling their oats enough to take on the Caliph as well. Yet these sorts of tactics seemed crude compared to what the Nazis had accomplished. And the Islamists would borrow many things from them. Their love of uniforms and banners. Even their salute, which can still be seen performed today by more than a few Muslim terrorist groups such as Hezbollah or the KLA. And their exploitation of political Anti-Semitism. 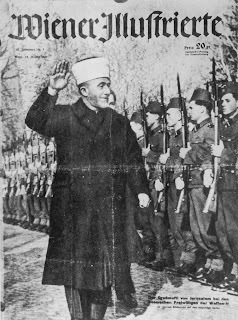 Had there been no Israel, the political Anti-Semitism of the Islamists would have been limited to domestic campaigns against Judaization, a theme duplicating that of the Nazis, but one that had existed beforehand in the Middle East. However the existence of Israel allowed the bulk of Jews living in Muslim countries a way out, and created Israel as a compass needle for the Islamists. For the Islamists, the State of Israel become a goad, a way to humiliate the rulers of the Muslim world, by pointing to their ongoing failure to destroy Israel. This allowed them to portray the rulers they wished to overthrow as weak, corrupt and inept-- while promising that once in power, they would destroy Israel. The obvious analogy to the propaganda used by the Nazis is there. And what WW1 was to the Nazis, a theme of Germany's humiliation that they would always return to, the State of Israel is to the Islamists. And after generations of Muslim children growing up immersed in that brew of hateful propaganda, it is not at all surprising that the hatred of Jews in the Muslim world has reached absolutely psychotic levels. Just as the Nazis turned defeating the Allies into the symbol of Germany's resurgence that would wipe away its humiliation in WW1, so too the Islamists turned killing Jews into the symbol of Islamic resurgence that would wipe away their humiliation over the independence of the Jews in the Middle East from Muslim rule. The same theme that had resonated in Germany, had far more reach in the Honor/Shame cultures of the Muslim world. And it has helped feed the war against the Jews, as even secular Muslim leaders feel obligated to maintain hostilities with Israel to stay ahead of the Islamists. While the Nazis certainly did not teach Anti-Semitism to the Muslim world, they did teach the Islamists by example how to better exploit it for political power. The Islamists learned not Anti-Semitism itself, but technique from Nazi Germany. 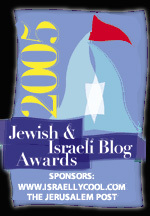 And it was not just the technique of exploiting Anti-Semitism, but many other techniques of political organization as well. Quasi-Fascism today remains common among political groups in the Middle East, who rejected the more liberal English and French models, in favor of the Fascist and National Socialist model. The results of this can be seen in politically sophisticated Islamist movements that monitor the media, use front groups, maintain social services for their supporters, employ uniforms, rely on support from the Muslim diaspora-- and the rest of the haul from Nazism, and of course Communism. For the greater mass of the Muslim world, Anti-Semitism is a belief. For the Islamist elite however, it is a technique. One of many that they have at their disposal. It is not an original technique. The idea dated back to Mohammed, but it also predated him. Hitler however provided an example of the sophisticated and sharper uses that it could be put to in order to promote ideological purity. And the Islamists have profited by his example. since the Paulnut explanation for terrorism seems to be gaining steam within, I think of the most effective responses to his "We make them do it" and "We are just creating more Terrorist, withdraw now!" idiocy is that its the Koran and Muhammed and 1300 yrs of Jihad History that Recruits for Jihad. Its what their Koran(Sura 9.5 and Surah 9.29 as example) tell them to do. Wonderful! Don't forget one more lesson taken from the nazis, the power of the media to demonize and dehumanize the Jews/Israel, and, boy, the Israeli media learned that so well. They manipulate the news to destroy the left's competition and the "settlers" of course. This probably seems far off topic but why do I get the feeling the RC Church will figure into this somewhere down the road? The Vatican was sympathetic to Nazis after all. I just see the Vatican waiting in the wings. Waiting for what I'm not sure but it will somehow involve their support of Nazis of the past and their growing and more blatant anti-Semitism, especially among traditionalist Catholics ala Pope Benedict. The Vatican wants Israel, particularly Yerushalayim. Would they ally themselves with Muslims to achieve their goals? The Vatican wants Israel, particularly Yerushalayim. Would they ally themselves with Muslims to achieve their goals? Yes Keli Ata, they not only would; they already are!